Every week Christopher and I get a produce box from a restaurant up the street called Heartland Cafe that has an organic farm in Michigan, and it’s like Christmas morning every time we get to pick up our box. I love forcing myself to be creative with all of the delicious fruits and vegetables we receive. Last week we got shallots, and believe it or not I had never cooked with a shallot before I made “tomato basil pasta sauce”. Now I’m hooked. They’re basically just little delicious fragrant onions. Yum. 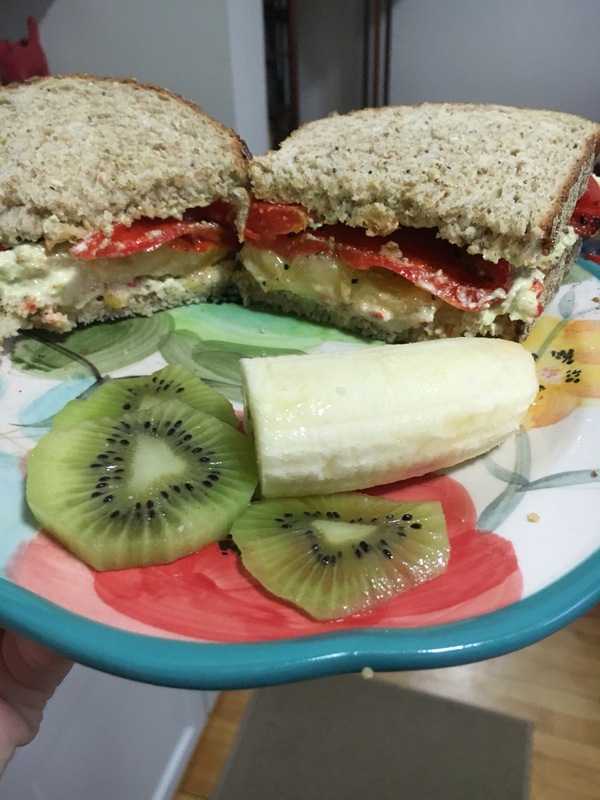 This sandwich is really just a combination of things I always like to have in my refrigerator. It’s super simple. Preheat the oven to 350 and cut the red pepper into medium sized strips. I ended up with six medium sized strips, perfect for two sandwiches. Layer the peppers on a baking sheet, or a glass pyrex container and drizzle them with olive oil. Then sprinkle them with salt, pepper, and garlic powder. You don’t need much as these peppers are naturally packed with flavor. Now stick them in the oven for 30 minutes. You can roast these peppers ahead of time and store them in the refrigerator if you want to make this a really quick lunch. Now take out your desired bread and toast it to your preferred crispness. I used a delicious 12 grain bread with lots of nuts and seeds. Now it’s time to layer the sandwich. Spread the hummus evenly over the bottom slice of the sandwich. I added some to the top slice too, just for good measure. I used edamame hummus, but you can use any type of hummus you enjoy! Next, slice the tomatoes and layer them on. I like to sprinkle the tomatoes with salt and pepper for a little extra flavor. Finally, layer on those delicious red peppers. Now it’s time to close the sandwich, pair with some fresh fruit and enjoy!